The crunch is on. There are only two days to Hanukkah, and until yesterday I had not put up Any Hanukkah decorations. There was the mad dash to get everything up. Of course, I couldn’t find some things I knew I had. But in the end I found everything and I have my Hanukkah Decorations Finally Up. I combine purely Hanukkahish decorations with things that are probably Christmassy, but which I have repurposed. No evergreens, though. I have them clustered in the living room, dining room and family room. Just take a look. My first Hanukkah Mosaic starts out showing the highboy with my Hanukkah Menorah, some glittery things and the flames from a tired looking Menorah door ornament that we retired last year inside wine glasses with strings of translucent beads. Next comes my Snow Queen (actually a tree topper that I repurposed for Hanukkah.) along with a star shaped candle and more beads in a glass. I have winter stuffed snowmen and some Hanukkah rubber duckies in the kitchen. And a mantle with another Winter Queen, a Menorah, more glass beads in glasses, a dreidel and some stars. Above those are two pictures I bought in Alaska with very winter scenes. Very appropriate, don’t you think? The second Hanukkah Mosaic begins with the Hanukkah table runner that I quilted last year with a plate with blue and white candles and beads in a glass. I also put the gifts on this table. The electric Hanukkah Menorah I have in my window. My Flying Winter Queen. (Yes, I really like my Winter Queens. Very Wintery. Love them.). And my table with a Menorah shaped bowl and some beads in a glass. I like using the beads in glasses. It gives sparkle without a lot of work. Outdoors, two different kinds of Beauty Berry are obliging us with holiday color. Sun was shining gloriously through some Miscanthus grasses, now turned yellow, and the remains of our Sweet Gum’s leaves. And birdies have found the feeder we moved in the front yard and love it. December is an interesting time. I celebrate Hanukkah. My housemate celebrates Christmas. So How do we decorate, especially in the years where they overlap? Hanukkah goes by the Hebrew calendar, which is lunar with 13 months every three or four years (Hebrew leap years). This means that the date in the English calendar changes from year to year. Hanukkah celebrates the Miracle of rededicating the Holy Temple after years of being used for non-Jewish worship. Only one cask of oil was found (enough for one day) and it would take a week to make new oil. According to tradition, the one cask burned for eight days. This is the Hanukkah Miracle that is celebrated. This is why we light candles or olive oil for eight days. Since Hanukkah usually starts first, I do decorating for Hanukkah about a week ahead. Then we bring out the Christmas decorations about a week before Christmas. Some decorations work for both holidays, although we keep the decorations fairly separate, so that each holiday will get proper respect. After years of going crazy finding the respective decorations, we finally started packing the Hanukkah only decorations in one box, Christmas only decorations in another box and the ones that work for both holidays in a third box. This works fairly well as long as we put them back in the right boxes. After my successes in making the Hanukkah table runner last year and the Rosh HaShanah table runner earlier this fall, I am making a Christmas table runner for my house mate. We decided on a simple tree pattern. I’m nearly done with the quilting. I sure hope I finish it. No Hanukkah is complete without Latkes. It is traditional to eat foods fried in oil in honor of the Hanukkah Miracle. Here is a recipe I adapted from Epicurious, since I couldn’t find mine.
. Peel potatoes and grate coarsely.
. Soak grated potato in water 2 minutes.
. Place potatoes and onions on kitchen towel and squeeze water out.
. Put in bowl and mix in egg.
. Heat 1/4 C oil in skillet.
. Form latkes by dropping 2 Tbsp into skillet.
. Drain on paper towels.
. Spread latkes on wire racks set on cookie sheets and keep warm in oven. Serve with sour cream and apple sauce. Enjoy! Here is a link to a fabulous Crispy Potato Pancake recipe by Athena McElrath at Minerva’s Garden. I have Got to try her recipe too. Would fit in wonderfully for Hanukkah. 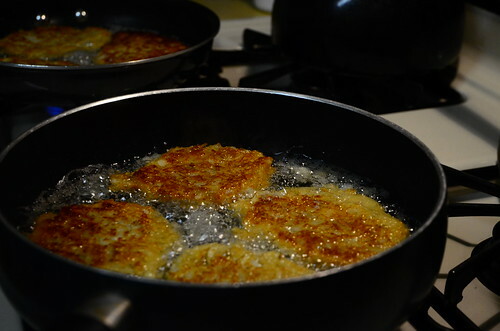 Hi Yael: So happy to see my potato pancakes here–I do hope you enjoy them! I love all your decorations. And what works of art your runners are for all the holidays–just magnificent, and brilliant colors–lovely. I am curious–you have such beautiful slender tapers for your menorah–I wondered where you purchase them? I can’t find any pretty and affordable candles around here where I live anymore, it seems. Take care, and have a lovely weekend! Thanks. It is fun decorating even though I am late this year. The small tapers are from boxes of Hanukkah candles that you can find this time of year. I bought the blue and white ones in Bed Bath And Beyond, which usually carries Hanukkah decorations in Salem and in Auburn WA. I think there are several stores in Vancouver. They will quite possibly have them. I have a box that is multi-color too, which I purchased in Israel, but I find those here too. The boxes are usually between $10-$15 for 44 candles about 8 inches tall (enough for the holiday). There are cheapie boxes in other places around $3-$5, but not nearly as nice. Hope you manage to find some. Have a great weekend. ps if you figure out how to add one more point to those stars, let me know!! Thanks for ccming by. It will be a challenge to do the extra point in the star. I would need to make an awful lot of creases in the metal. Wish me luck in trying. Thanks for sharing your traditions and decorations, Yael! The runners are beautiful! And sounds like you’ve got an organized system for keeping the two holiday separate which I’m sure can be challenging. Have a great week! Thanks. And thanks for stopping by. Hope that you have a great week and joyous Christmas season. I clicked over from your link at Make the Scene Monday at Alderberry Hill. Yea for Chanukah posts! 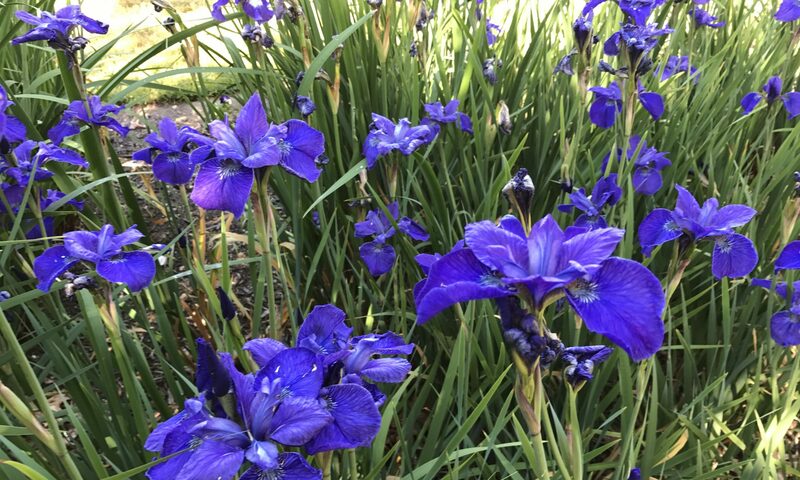 You have a great blog full of wonderful gardening info. Coincidently, we just got home from the nursery as we are trying to plan new landscaping for our yard. I would love for you to visit my blog and view my posts on Chanukah. I’ll save some latkes for you! Happy Hanukkah. Thanks for coming by. So nice to see someone else posting on Hanukkah too, I’ll be right over for some of those latkes. Your Hanukkah decorations are very nice, especially the runners you’ve made. The first time I saw potato latkes was on Martha Stewart years ago and I have tried making them, they’re yummy. Thanks and thanks for coming by. I love latkes. We will probably be making some in a day or two. Oh I hope that you have celebrated a wonderful and happy Hanukkah. Your decorations are terrific and how clever to repurpose items such as the tree topper for your Snow Queen. I have only enjoyed latkes once in my entire life and they were heavenly. They don’t sound so terribly difficult to make. Thanks for the recipe. Thanks and thanks for coming by. We have been happily celebrating the first two nights now. I hope to have time to make latkes tomorrow or Tuesday. Hope that you have a great week and happy Christmas season. איזה יופי של קישוטים!! אנחנו לא רגילים לקשט, חוץ מחנוכיות וסביבונים, כך שזה ממש נחמד לראות מסורת אחרת. Todah she bat. Ve’todah. Anachnu ken m’katshim l’Hanukkah harbeh yoter mi she b’Yisrael. Afilu ha’ben sheli (she’be’Beit Shemesh) lo mekashet ve hu gadal be’Artzot haBrit. Ma she hu ken oseh sh’ani ohevet zeh lasim Menorat Shemen bahootz le’chalon betoch zechoochit. Ani mekavah she at hogeget et Chag Hanukkah be’simchah. Thanks and Happy Hanukkah! I have never tried latkes with zucchini. Yumm. The Hannukah decor is lovely…I especially love that table runner! My oldest son’s GF in high school had Hannukah at her house for us and then she and her mom would come to our place at Christmas. It was so much fun and I loved her mom’s latkes. I had made potatoe pancakes on occasion but her mom’s were pure heaven….extremely thin and crispy…yum !